Herbs de Provence? Oui, merci! Do you ever have one of those days? You know, the day where nothing happens according to your plan? Today is definitely that day. 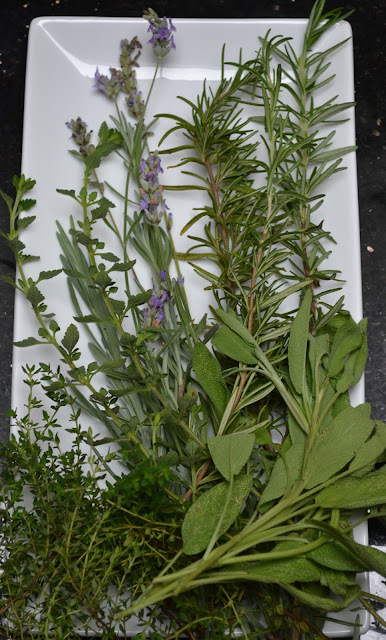 My plan for the morning involved sharing with you a recipe for Herbs de Provence. “Herbs de Provence” transport you to a lavender field in—well, Provence? And I'm still going to share it with you. But here's the thing: this morning, as I went to the garden to harvest the herbs I needed, I encountered a small problem. Now, I know our gardens are a bit...unruly. OK, they're jungle-like at the moment. The lemongrass towers over the thyme. The basil battles the rosemary for space. The sage is strangled by the oregano. Fighting through the herbs and weeds—and not finding the savory--I decided that it must be hidden. I moved vines, pulled weeds, looked under leaves. I searched all four herb gardens...no savory. Either some critter decided to have a savory snack—or the competition in the garden got too fierce for its survival. No problem. I decided to head over to a nearby nursery. OK, I went to a not-so-nearby nursery. I considered driving to a much-further-away nursery...but the sudden torrential downpour inspired me to stop by the grocery store instead. No savory. I hoped for a fresh packet—but they didn't even have dried savory. My Herbs de Provence will not include savory. But—the recipe I'm giving you will. While I often preserve produce, I tend to neglect harvesting herbs to store. I'm spoiled, I suppose—I cut herbs as I need them for meals. Still, preparing a mix of some of our favorite herbs saves time, plus the flavor evolves as it ages. Although Herbs de Provence sounds pretentious, it's really a simple blend of dried herbs typical to the Provence region of France. The blend can be used to flavor grilled foods, such as fish and meat, or added to vegetables and stews. You can also infuse oil with Herbs de Provence. My herbs—minus the savory—are drying. I typically use fresh herbs when cooking, but the dried herbs will store well for up to six months. Crush the herbs using a mortar and pestle or large knife until very fine. Combine the herbs and place in an airtight jar. Store in a cool, dark location. The best part of creating Herbs de Provence? Your hands smell divine for the rest of the day!